When we left off last time we were still in the USA. The rest of the trail in Maine is mostly road walks. We did pass through a Mennonite farming area. This picture is of a horse drawn hay baler at a repair shop. I stopped a the general store and when I entered I thought they had a power outage until I noticed there were no lighting fixtures. They even had a crank-operated cash register. They had bulk foods, hardware and boots for sale. It was along these roads that we saw our first IAT blazes. This is a signpost for one of the 2 shelters and camping areas in Maine. We had lunch at the Blue Moose Restaurant that "Nimblewill Nomad" says is the best on the trail. At Mars Hill the trail goes off road for the first time. It's a steep climb up a ski trail and then north to the Canadian border. The only "guard" at the border was this dog who barked whenever we came close. I wonder if she's on the payroll. The next day was Darcy's first day of hiking since her blisters. They hiked the 15 miles up the border to customs at Ft Fairfield. The trail goes up the "cleared" area on the border. They got to within 3 miles of the end and could not find the trail. There are many ATV trails that cross the IAT and get used a lot more. They wandered into a potato field and asked directions from someone mowing grass in his yard. They ended up walking on a road that paralleled the trail and into customs where I was watching in the opposite direction. The next day they hiked into Canada. I moved the RV to a campground in Perth-Andover, New Brunswick and waited for them at the bridge. Since the trail is an abandoned railroad bed, I decided to bike to meet them. I rode out 5 miles and couldn't find them. I rode back to the car and waited 2 more hours and they still weren't there. I thought they might have gotten past me and checked at the campground but they were not there. I went back to the visitors center where I had been before. The people there wanted me to call the Mounties for a search party, but I said no and that I would check at customs where they had started that morning. I drove to the border and then back to the campground. I was leaving the campground when a worker asked if I was looking for 2 hikers. He said they were in the restaurant eating lunch. They had sent the campground owner to town looking for me. They had been waiting for 2 hours at the other end of the bridge and thought I was lost or something. We had passed while I was biking and they had left the trail to look for the bridge. The IAT north from Perth-Andover is on the New Brunswick Trail, a rail-to-trail that follows the Tobique River. The people in this area are very aware of the trail and are very friendly. The "Hiking Ladies" as they called Darcy and Judy were invited for fresh, hot muffins and sodas and cookies on several occasions. We stayed at the city campground in the village of Plaster Rock. Fiddleheads are a local delicacy. I think they are a type of fern that they sautee in butter. I didn't try them. The trail north from Plaster Rock is three days of road walk. At the end of the second day there is a newly constructed shelter at the home of Bill Miller, the "mayor" of Nictau, NB (pop 16). He invited us to park the RV in the yard and to plug into his electric. We were also given a tour of his canoe factory, the local history and we were invited for lunch and dinner. Bill is showing a canoe coffee table he made. He's shipping it to a customer in South Africa. I want one. Bill and his girlfriend Jane had picked 90 pound of strawberries the day before and were making jam. We had fresh strawberries over homemade shortcake with homemade whipped cream for desert at lunch and dinner. No, It's not on my diet! 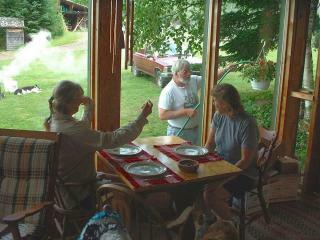 You'll notice the smoke outside where Bill is watering. They keep a fire going in the "pot" and put in wet shavings to make smoke to keep the black flies away. It works but you smell like smoke all the time. Bill explained all about how his family has been making canoes and paddles for 3 generations. Here he is showing Judy a $1000 birdseye maple paddle he carved. We also visited the Tobique Salmon Barrier. Bill explained that this used to be a popular area for hunting and salmon fishing. A door in his house is from the Miller Hotel where Pres. Roosevelt and Babe Ruth stayed. Because of dams that were built and poachers, the salmon were endangered. They place fences across the river to hold them in a half-mile long area. This is a picture of the observation cabin where they can watch the river. We arrived at Mt. Carleton on 7/14 and stayed three days. The trail makes a circle in the park so that you can climb Mts. Carleton, Head, and Sagamook. Except for distant sightings of moose, the only wildlife is the vicious bunnies in the campground. The hiking over the mountains is the first"wilderness" hiking in Canada. It was nice to see an IAT blaze in the woods. There were two more days of roadwalk into Kedgwick where we are staying at the Lumber Museum and campground. Included with the tour is a desert of cake with maple syrup over it.